Red Pandas - very cute and lovely animals although much less famous than their distant cousin giant panda. Well, needless to say that I spend most of my time waiting for this shy baby to come down from the canopy of a tree where she was hiding – but it did not happen (in my time there). 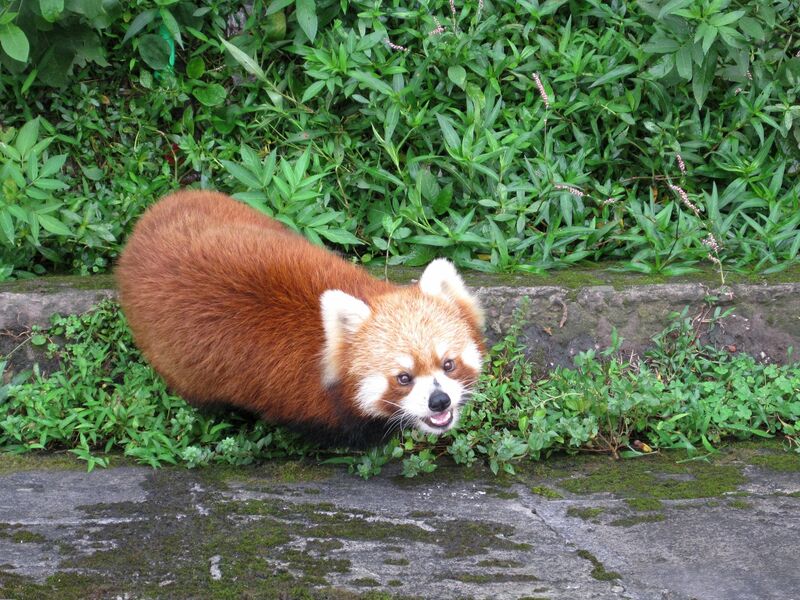 For sure I did not let the opportunity of seeing red pandas to pass-by when traveling in China. With the great enthusiasm and hope I visited the Chongqing Zoo and later the most renowned panda center in Chengdu – The Research Base of Giant Panda Breeding. The last one although dedicated mainly to giant pandas, holds also a small population of red pandas classified as vulnerable and protected by law species. For his beautiful reddish fur and long soft tail with six alternating yellowish-red rings, red pandas were precious targets for poachers. Honestly, once I saw for the first time the red panda I was quite surprised (I’m sure you are as well), because the red panda resembles rather a raccoon in size and appearance than its distant and big - giant brother. I was lucky to see all these red pandas moving and active, apparently such moments do not last for long because red pandas, similarly as their big "cousins" giant pandas spend most of the day sleeping. They are mainly active during the night and at the dusk. Red panda is small by all accounts – the adult weights between 3 to 6 kg (6.6 – 13.2 lbs)and has a length from 80 to 120 cm (including the tail of 30 to 60cm). It lives in the Himalayan forests in western Nepal, India, Bhutan, northern Burma and mountains of Chinese southwestern provinces Sichuan, Yunnan and Tibet at altitudes from about 1800 to 4000 m (4900 to 13000 ft). Red panda’s diet similarly to that of its “distant cousin” consists mainly of bamboo, grass, roots, berries. However occasionally it can eat also insects, eggs and young birds. 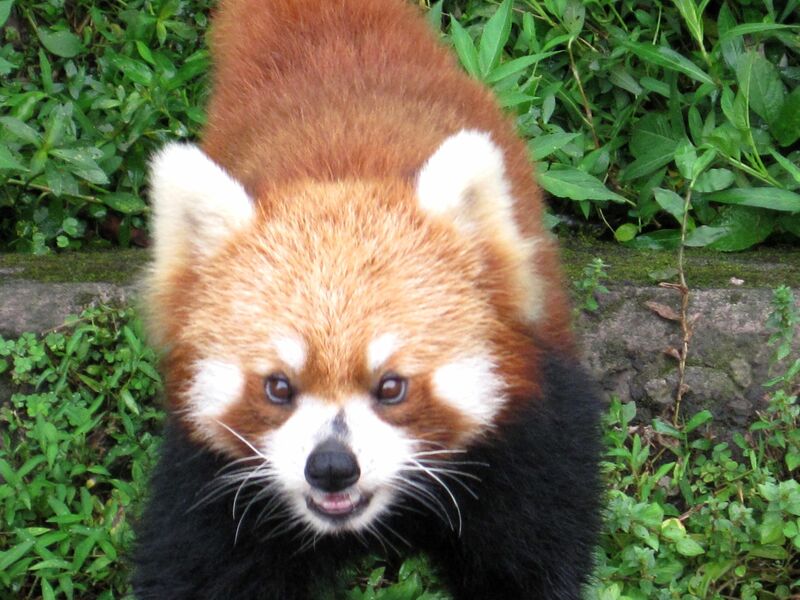 Red panda has a digestive system of a carnivore (meat eater) resulting in problems with digesting fiber-rich food. 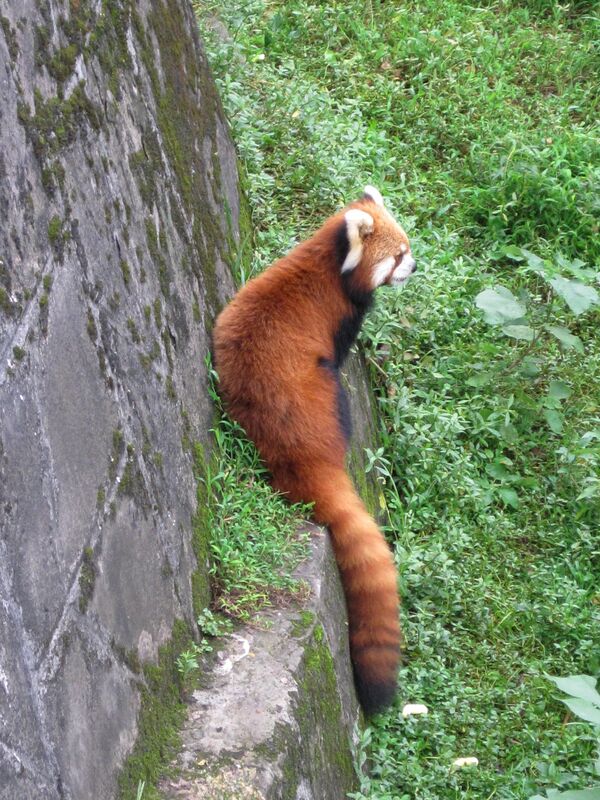 Red pandas are great climbers what helps them finding rescue from many predators in the canopy of trees. In situation of danger, when they are frightened or angry, red pandas stand on their rear legs to look bigger and give sharp hisses (like a cat) or a series of snorts. Red pandas share not only the name with giant panda but also the type of habitat, diet as well as some physical features. For example both pandas have pawns with five fingers and an extra, very unique enlarged bone called “pseudo-thumb” that helps them to grip the bamboo shoots they consume in large quantities every day. But these are about all commonalities. Genetically the red panda and the giant one are very distantly related with a common ancestor living back tens of millions years ago. The truth is that they are much closer related to skunks and raccoons! There is no reliable information about the number of red pandas living in the wild – the suggested numbers are somewhere between few thousands and twenty thousands. Whatever they are, the red panda is classified as a vulnerable specie and protected by law. It is interesting to note that red pandas were known to the west much earlier than the giant pandas. That is why the word “giant” was later added to the name "panda" as an extra "differentiation” from their small cousins. Another name used for the red panda is “Firefox” – certainly justified by its physical appearance and reddish-brown fur. Apparently red panda's name has nothing to do with the name of the well known Web Browser Mozilla. This way we finished the trip to the land of pandas presented by the Free Red Pandas and Free Giant Pandas pictures. I hope that you found on these pages interesting information and facts as well as enjoyed amazing pictures.